One of my favorite pass times is trying to figure out how to make modular construction work. 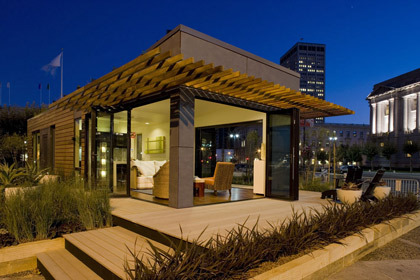 Over the past ten years I have seen a lot of design work done with the intent of creating viable modular construction, but I cannot really say that I see a lot of successful projects. There are a handful, but searches on the Internet get you mostly architectural firms and consortiums that have nice looking renderings without any real photographs. Design magazines say that modular is the way of the future, but don’t put a whole lot of meat on the issue. Then again, maybe I want too much information from a magazine. That would bore their readership to death. There are, of course, a few diamonds. One of those is Michelle Kaufmann, who has lines of good looking homes and a few larger projects that seem to work. I ran across her when I saw her as a judge for the Urban re:Vision Dallas design competition and have followed her tweets and website activity ever since. There are others, but she seems to be the shining light. Here is my overall take on it: what has been accepted as “modular construction” by architects and designers is really reserved for the elite client. The elite client who doesn’t want a lot of space, loves modern architecture, and is a little quirky. Oh yeah, and they have a lot of money. That really pares down the clientele. These designs run in about the $200 per square foot and up range, but I have not actually seen a $200 per square foot example (much like when you go to the Mercedes dealership – who can find that C class that is actually $33,000 on the lot? Who wants that one anyway?). This, however, does not include land costs, foundation costs, utility costs, soft costs (architecture may be included, but you will need civil engineering, structural engineering (sometimes), geotechnical engineering, permits, etc.). Oh, yes – and land. A lot of designers want to think that the modular home should solve the World’s problems, enabling access to cost effective, sustainable homes to everyone. Some of this actually works: as a Habitat for Humanity, for example, uses a panelized modular system (at least in my area) which is easy for volunteers to erect. I have not seen a breakdown for costs of habitat houses, but they “compete” with new construction that costs about $60 per foot to build. So, I am a member of a small team that wants to make this work for the rest of us. We have started with what does work, which is a far cry from the beautiful designs of Ms. Kaufmann. I’ve toured a few plants who pump out what they consider modular construction – they are basically mobile homes or construction trailers which are either put together in a sprawling fashion or stacked one on top of the other. Most are grey and blue or maybe two tone beige with windows which can be easily fitted with security bars. The level of craftsmanship is there – especially when visiting modular barracks for our armed forces. Those projects in particular have a unique set of parameters, and the modular systems do answer to those. So, we know it works. It is not beautiful, but it works. I feel that when working with some manufacturers, they simply do their homework and figure out how to make their product either parity with site built construction or charge a little bit of a premium, indicating that the shortened amount of construction time is where you see the savings (any manufacturers I have sited on this blog are not ones I have toured or had conversations with). Looks good during a presentation. However, when you sit down and look at everything, one would find that since the project is so front loaded cost-wise, interest carry from a loan becomes a much larger issue – and a lot of money is spent before anything actually happens on site. OK for an all cash deal, but not for the everyday homeowner, contractor or developer. Especially when you’re building a $40,000,000 project. On top of that there are more complications which I don’t care to get into, other than to say it evens out the playing field to the point where it doesn’t make sense to move ahead using modular construction (don’t forget, you also have to sell this). There has got to be a way to make this cheaper, as it just makes sense. Better use of material? Sure. Tighter control of craftsmanship? Absolutely. Beautiful? Well, it is the eye of the beholder, and right now it will cost you. Hopefully that will change!